The Cost of Waiting to Buy is defined as the additional funds it would take to buy a home if home prices and interest rates were to continue to increase. So far in 2018, both interest rates and home prices have continued to increase. If rates continue to increase 1% higher from where they are today, a buyer who can afford to purchase $800,000 today, will only be able to afford $714,000 using the same monthly payment, which is a loss of 10.75% in purchasing power. It looks like rates are going to continue to move higher again over the next few months, as the technical trading signals are growing louder and more dangerous. With every moment that the 10-Year Treasury remains above the 2.95% technical level (see chart below), it is looking likely that rates have turned 2018’s previous ceiling into a floor. This means the 10-Year Treasury is probably going to increase to the next technical trading level of around 3.35%, which will increase the 30-year mortgage rate another “.30” from current levels. The 30-year mortgage rate follows the direction of the 10-Year Treasury. This means we are looking at 5% interest rates soon. If you know of any buyers who have been putting off a home purchase, let them know their interest rate is probably going to increase as each month goes by. Here is a good chart that all buyers should review, that shows the “impact of rising rates on a buyers purchasing power or affordability”. As you can see, if rates just increase by 1%, from current levels of 4.5% to 5.5%, a buyer will lose 10.75% in purchasing power. Here is an example below of the potential extra cost for waiting to buy a $750k home, if both rates and home prices continue to increase. As of today, if a buyer pays a point they will be able to buy down the rate to 4.02%. But if rates increase to 4.80% and the home price increases by 5% over the next 12 months, the monthly payment will increase from $3,589 to $4,127, which is an increase of $538 a month. This amounts to an extra $6,456 annually, and $193,680 over the life of the loan. Therefore the cost of waiting to buy this home could cost an extra $193,680. Here is another example below of the potential extra cost for waiting to buy a $250k home, if both rates and home prices continue to increase. As of today, if a buyer pays a point they will be able to buy down the rate to 4.3%. But if rates increase to 5.1% and the home price increases by another 4% over the next 12 months, the monthly payment will increase from $1,237 to $1,415, which is an increase of $178 a month. This amounts to an extra $2,136 annually, and $164,080 over the life of the loan. Therefore the cost of waiting to buy this home could cost an extra $64,080. When compared to rates historically, current rates are still very cheap. This chart below puts current mortgage rates in perspective. Did you know the average 30 year fixed mortgage rate over the past 40 years is roughly 8.7%, and 6.29% over the past decade. Compare this to current rates around 4.5%. As rates are going to continue to increase, current rates are still a gift to anyone looking to borrow money to finance a home. It is still a good time to buy a home, as the cost of borrowing money to finance a home is still historically very low. It is a great time to get out there and shop for homes. We are entering the summer months soon, which means there will be more inventory available. I tell my buyers not to focus on rising rates or home prices. Find a home that you love and that you can afford for your family. If you have any questions about any of this information above, please feel free to contact me directly at 858-442-2686. I look forward to chatting soon! Instead of renting for $3,600 a month, did you know you can purchase a $600,000 home with only 5% down with No monthly mortgage Insurance “PMI” for the same monthly payment. When you factor in all the financial benefits and tax deductions you get to take advantage of when you own a home, it is cheaper to own a home versus rent in many parts of California. Check out the “Own vs Rent” report below comparing renting versus owning for $3,600 a month. There are many renters in California paying monthly rent around $3,600. What many renters don’t know is, how much home they can purchase for the same monthly payment. Instead of paying $3,600 a month in rent to your landlord, did you know you can purchase a $600,000 home with only 5% down conventional jumbo financing with No monthly mortgage insurance “PMI”, for the same total monthly payment. Check out this “Rent vs Own” report below comparing renting versus owning for $3,600 a month. On the left column is the $3,600 in monthly rent. On the right column, for the same monthly payment of $3,600 a month, you can buy a $600,000 home with a down payment of 5% using conventional jumbo financing, with an interest rate of 4.625% with NO monthly PMI. The total PITI payment is $3,600 a month, which includes principal and interest, property taxes and homeowners insurance. As you can see above when owning a home, $733 a month will go towards paying down the principal on the loan. You will also get to claim tax benefits of $978 a month. Both of amount to $1,712 a month in total benefits. Compare this to zero tax benefits when paying rent of $3,600 every month. In this section of the report, it compares how much rent versus principal you will pay over the next 10 years. By owning a home, you will have paid down the principal on your loan by $111,677 over the next 10 years. Compare this to paying $495,240 in rent over the next 10 years with no financial benefits. As you can see below, when owning a home you will be able to claim tax benefits of $978 a month. Over 10 years the tax benefits amount to $109,198. When paying rent of $3,600 a month, there are No tax benefits. In this section of the report, it compares your net worth after 10 years of owning a home versus renting. By owning a home, you will accumulate a net worth of $348,027 over the next 10 years, from the financial benefits of home ownership. The 3 main financial benefits to owning a home are, paying down the principal on the loan, tax deductions, and accumulated equity gains due to appreciation on the property. In this example I used a conservative 3% annual appreciation rate. Whereas with renting over the next 10 years, you will have a zero net worth, as there are no financial benefits to paying rent. Click HERE for more information on how to qualify for this loan program above, the 5% down conventional jumbo loan program with No monthly mortgage insurance “PMI”. There is also a Q&A section in the article too. As rates have already increased over “.5” since the New Tax Bill was passed in December, it is important that buyers understand that rising mortgage rates do more to influence their home affordability than rising home prices. Here is a good chart below to share with home buyers. It shows the “impact of rising rates on a buyers purchasing power or affordability”. Current jumbo rates today are around 4.5% on a 30 year fixed. If a buyer can afford $600k at a rate of 4.5% today, but rates increase by another 1%, the buyer can only afford $535,500, a loss of 10.75% in affordability. Based on how rates are currently trading, it looks like mortgage rates may be moving towards 5% over the next several months. It’s still a great time to purchase a home, especially as the cost of borrowing money is still very low historically. The average 30-year fixed rate over the past decade was 6.7% and over 8% over the past 20 years. When you crunch the numbers and weigh up all the financial benefits that come with home ownership, and compare it to what you are paying in rent, you will be surprised how much home you can actually afford to buy in many cases. A good idea is to talk to your accountant and ask them what the mortgage interest deduction and deduction for real estate taxes will do for your income, you will probably find it is now cheaper to own than to rent in many areas. Remember too, when you own a home, it is also a hedge against inflation for the future too. When you own a home, you will get a low fixed rate mortgage and your principal and interest payment will never change. Whereas rent will continue to go up over time. In this market, it is important that buyers are been given all the information they need so they can make an informed decision about buying a home. These “Rent vs Own” reports are a great tool for buyers to review, because it shows them all the financial benefits and different figures they need to see when making the decision to purchase a home. If you would like more information on the “Rent vs Own” report like this example above, please contact me directly at 858-442-2686. I look forward to chatting soon. The “Cost of Waiting to Buy” is defined as the additional funds it would take to buy a home if home prices and interest rates were to continue to increase over the next 12 months. Mortgage rates have already increased “.5%” since the New Tax Bill was passed in December and are now at 3 year highs. Did you know that just a “.5%” increase in rates reduces a buyers purchasing power by 5%, which means a buyer being able to afford a $570k home instead of a $600k home with the same monthly payment. Here are 5 reasons to purchase a home soon in 2018. It is important that buyers consider rising interest rates and rising home prices when thinking about the true cost of a home. The “Cost of Waiting to Buy” is defined as the additional funds it would take to buy a home if home prices and interest rates were to continue to increase over the next 12 months. This example below is for a $750k purchase. It shows the additional funds it would take to buy a home if rates increase from 4.02% to 4.80%, and the home price increased by 5% from $750k to $786,750. The monthly payment will increase from $3,589 to $4,127, which is an increase of $538 a month. This amounts to an extra $6,456 annually, and $193,680 over the life of the loan. That means a buyer who waits a year to purchase a home, could pay an additional $193,680 in interest and payments over the life of the loan to purchase the same home. It has been a rough ride for mortgage rates since the New Tax Bill passed, see below. Rates have already increased by “.5%” in just the past month and are trading at 3 year highs. With the new administration talking up higher spending, lower taxes, protectionist trade policies, and deregulation all adding up to inflation (inflation is the mortal enemy of bonds and low rates), all of this is causing rates to increase. The 10-year Treasury is one of the main drivers for the direction of long term rates. The 30-year fixed mortgage rate follows the direction of the 10-year Treasury. As you can see below, the 10-year Treasury has broken through several ceilings of resistance over the past month, and is approaching 5 year highs around 3% from back in 2013. If the 10-year Treasury continues to move towards 3%, it means 30-year fixed mortgage rates are going to increase another “.25%” from current levels. If you or someone you know is planning on buying a home in 2018, or looking to refinance, it would be a good idea to try and lock in a rate soon as the current trend is for rates to continue moving higher. Here is a good chart below that all buyers should review, that shows the “impact of rising rates on a buyers purchasing power or affordability”. As you can see on the chart, when rates increase by just “.5%”, a buyer loses 5% in purchasing power. For example, see how the payment at the 4% rate on a $400k loan, is roughly the same payment as the 4.5% loan at $380k, a loss of 5% in purchasing power for a buyer. If rates increase by 1%, from 4% to 5%, a buyer will lose 10% in purchasing power. This means, if a buyer can afford to purchase $600k today, but rates increase by 1%, they will only afford $540k using the same monthly payment. Many housing experts are predicting home prices will continue to increase in 2018, and increase around 5% for most markets in California. 2018 will probably play out the same as 2017 for many California markets, where limited inventory and strong demand for homes will continue to push purchase home prices higher. The San Diego County median home price finished 2017 at one of its highest points. The median home price was $540,000 in December, tied for second-highest of the year, capping off a year of record price gains, said real estate tracker CoreLogic. In 12 months during 2017, the median price in San Diego increased 9.1%, outpacing the 4.2% yearly increase in 2016. One thing to keep an eye on is the effects of the new tax law. The new tax law caps the mortgage interest deduction and the deductibility of state and local taxes, so this may impact the upper-end market in 2018. Precisely how and the extent of which remain to be seen. Even though rates have increased over the past month and look like they will continue moving higher in 2018, the current cost of borrowing money to finance a home is still low when compared historically. This chart below puts current mortgage rates in perspective. Did you know the average 30 year fixed mortgage rate over the past 40 years is roughly 8.7%,and 6.29% over the past decade! Share this chart with anyone who thinks current rates around 4% are too high. Current rates are still a gift and should be taken advantage of by anyone looking to borrow money to finance a home. Who knows how high rates will move over the next few years. They certainly cannot stay this low forever and will one day revert to their mean. All evidence above suggests that rates and home prices are going to continue to increase over the next 12 months. A good tip for buyers is to focus on the monthly payment and NOT the rate. Yes rates have been increasing recently, but is the monthly payment still affordable? If the payment is still affordable, do not focus on rising interest rates. This time of year is also a great time to get out there and shop for homes. Buyers who purchase homes in the spring always note there is less competition, so you can negotiate better terms with the seller. If you have any questions about getting approved for financing, please feel free to contact me directly at 858-442-2686. I look forward to chatting soon! In today’s competitive housing market where inventory is limited and multiple offers are the norm, it is important that a buyer’s offer stands out from the crowd. Buyers and agents have to be creative with their offers and also provide full transparency upfront, so the seller will feel comfortable that a buyer will be able to obtain financing and close escrow. Here are 8 tips that will help your purchase offer stand out from the crowd and get accepted. 8 Tips to Help your Offer stand out from the crowd. Here are 8 tips that will help your purchase offer stand out from the crowd. A good idea is for the buyers to write a personal letter to the seller, so they can explain why they love the home and why they are the perfect buyers to purchase their home. Include this letter with your offer and also include a family picture too. If you can tug at the heart strings of the seller, they may be more inclined to choose your offer over others. Many agents and buyers tell me this strategy works like a charm! Include a loan approval letter with your offer that clearly explains what type of financing the buyer is getting and how much they are putting towards the down payment. Make sure the loan approval letter is signed by the lender and lists their contact info too, so the seller can call and verify all the information. If you are qualified for conventional financing and putting down 20% or more, write this into the loan approval letter, as this will usually place ahead of an offer with a lower down payment. If you are submitting a FHA or VA offer and are using a limited or zero down payment, follow the rest of these steps below to strengthen your offer. Always include a Conventional, FHA or VA DU underwriting approval with the loan approval letter to strengthen the offer. A DU (desktop) underwriting approval is when a buyer’s loan application, credit report, income and assets have been ran through the conventional, FHA or VA automated underwriting systems and was approved. A DU underwriting approval displays the most important information on a buyer’s profile. For example, a DU approval verifies a buyer’s credit scores, debt to income ratios, down payment amount, total assets and reserves, and the type of loan program they are approved for. This is a great tool to discuss the strengths of the buyers profile with the seller, so they can see how well qualified the buyer is. Always include proof of down payment funds along with your purchase offer. Make sure the name on the bank statements, or any other account being used for the down payment, matches the buyers name on the contract and approval. Always verify there are enough funds in the statements to cover the down payment listed on the offer. If the buyer is getting a gift from a family member, provide a gift letter and proof of funds from the donor so the seller knows where the funds are coming from. Being able to close a transaction faster is another way to entice the seller to accept your offer in this competitive market. For example, if a seller is reviewing 3 offers, and there is a 17 day offer, a 30 day and 45 day offer, often the seller will go with the faster closing. My company Citywide Financial Corp can close a Conventional or FHA Purchase Transaction in 17 days, and a VA purchase in 21 days. I have a great team set up with 2 loan assistants dedicated to help close transactions fast. Contact me for more details on how we can close your transaction faster. Want to show a seller how serious your offer is? Consider putting down a bigger deposit in earnest money. This may seem risky for some, but earnest money is there for a reason. If you are uncertain about putting a “noticeable” amount of earnest money on the table, it may be a sign to the seller that you are uncertain about the house itself. For example, can you be flexible on the closing date for the seller? Also, a purchase offer asking for seller credits to pay for your closing costs will usually place behind an offer that does NOT ask for any seller credits. Instead of asking the seller for a credit, we can give the buyer a lender credit to pay for some or ALL the buyers closing costs. Another tip is to offer to pay for the sellers Owners title policy and transfer tax. These fees only amount to roughly $2,500 on a $400k home, so this is another way to sweeten the deal for the seller to accept your offer. 8. Offer one month of free occupancy. When purchasing a home with a mortgage, your payment doesn’t actually come due until a month after you close. Why not offer it up to your seller to sweeten the deal? A seller could very well need that occupancy and offering to pay their “rent” for a month could strengthen your offer. I hope you founds these 8 tips helpful. The offer that is presented the clearest, is flexible, and addresses any issues upfront, is usually the offer that stands a better chance of getting accepted.If you have any questions about any of these tips above or getting approved for financing, please do not hesitate to contact me directly at 858-442-2686. I look forward to chatting soon. The new income tax bill goes into effect for tax year 2018. Many people are asking how this will effect mortgages and rates in 2018. For example, did you know the mortgage interest on a Home Equity Loan “HELOC” is no longer tax deductible under the new tax bill? I listed a summary below of the main points in the new tax bill that will affect home buyers and sellers and homeowners in 2018. The new tax bill has already had an effect on mortgage rates. Rates rose to their highest level since the summer following congress passing the the tax bill, see chart below from Freddie Mac. This is something to keep an eye on over the next month or two, as lower taxes and deregulation all add up to inflation, and inflation is the enemy of bonds and low rates. Current mortgage rates are still very good historically. With a 740+ score and 20% equity, we can get a buyer 3.875% on a 30-year conventional fixed rate, 3.625% on a 20-year fixed rate, and 3.25% on a 15-year fixed rate. FHA and VA 30-year fixed rates are around 3.5%. If you or someone you know is planning on buying a home in 2018, or looking to refinance and lower the current rate, it would be a good idea to get approved for financing soon in case rates continue to increase. Changing mortgage rates do more to influence home affordability than changing home prices. This chart below shows the impact of rising rates on a buyers purchasing power. As you can see on the chart, when rates increase by just “.5%”, a buyer loses 5% in purchasing power. For example, see how the payment at the 4% rate on a $400k loan, is roughly the same payment as the 4.5% loan at $380k, a loss of 5% in purchasing power for a buyer. A 1% increase in rates reduces a buyers purchasing power by 10%. For example, see how the payment at the 4% rate on a $400k loan, is roughly the same payment as the 5% rate loan at $360k, a loss of 10% in purchasing power for a buyer. In a high cost market like San Diego for example, a 5% reduction in purchasing power means a buyer being able to afford a $570k home instead of a $600k home with the same monthly mortgage payment. How Will the New Tax Bill Affect Mortgages in 2018? Here are some of the main parts of the new tax bill that will affect homeowners, home buyers and sellers in 2018. 1. Downsized mortgage interest rate deduction: New home buyers would now only be able to deduct interest on the first $750,000 of mortgage debt on a newly-purchased home—down from the current $1 million threshold, but higher than the $500,000 limit the House proposed in its tax overhaul in November. The good news is that existing mortgages are grandfathered in. The new cap would also apply to mortgages on second homes. The original House bill wanted to eliminate the deduction on second homes. 2. Interest on Home Equity Lines of Credit “HELOCs” are no longer tax deductible. This is for existing HELOC’s and new HELOC’s. Solution. If you are looking to borrow money to pay for home renovations or payoff credit cards, doing a new first mortgage cash-out refinance will probably be a better option, as you can still deduct the interest on the loan. 3. Limit on property tax deduction: Taxpayers will no longer be able to fully deduct state and local property taxes plus income or sales taxes. Instead, the legislation allows individuals to deduct up to $10,000 in state and local income and property taxes or state and local property and sales taxes. That means homeowners living in high-tax states like New York, California, and New Jersey for example, could see an increase in what they owe. 4. Tax break stays for home sellers: Both the House and Senate bills originally wanted to scale back a tax break for homeowners when they sell their home for profit. Taxpayers will still be able to exclude up to $500,000 (or $250,000 for single filers) from capital gains when they sell their primary home, as long as they’ve lived there for two of the past five years. Earlier tax reform proposals would have increased the live-in requirement to five out of the last eight years, so this is good news this is staying in place. There are some excellent low down payment options available to all buyers to help them buy a home in 2018. With the new higher Conventional, FHA and VA loan limits available for 2018, see HERE, here are the top 4 low down payment purchase programs available for home buyers in 2018. 1. If you need to borrow up to $453k, you can buy a home with only 1% down conventional financing with No monthly mortgage insurance “PMI”. We can also give a buyer a lender credit to help towards their closing costs. Click HERE here for more details how to qualify for this 1% down program. 2. If you need to borrow over $453k and up to $679k, you can buy a home with only 5% down conventional jumbo financing with No monthly PMI. All of the down payment can be gifted too. We can also give a buyer a lender credit to help towards their closing costs. Click HERE here for more details how to qualify for this 5% down program. 3. Military buyers can purchase a home up to $679k with zero down payment. We can also give a buyer a lender credit to cover all their closing costs. Click HERE for more info on how to qualify for zero down VA financing. 4. You can buy a home with only 3.5% down FHA financing up to a loan amount of $679k. All of the down payment can be gifted too. We can also give a buyer a lender credit to cover all their closing costs. Click HERE for more info on how to qualify for FHA financing. If you have any questions about a loan program or getting approved for financing, please feel free to contact me at 858-442-2686. From my family to yours, we wish you a Happy New Year. I look forward to chatting soon. P.S. Please join my Citywide Financial Facebook Page if you would like to be updated faster on any new loan program changes or industry news. The 5% down Conventional Jumbo mortgage with No PMI is helping lots of buyers finance a home in higher cost markets like San Diego, Orange County and LA, where a jumbo loan is needed to purchase a home. I hear all the time from buyers who tell me they assumed they needed to save up 20% to buy a home without monthly mortgage insurance. They are excited when I tell them they only need 5% down to remove the monthly PMI. Being able to remove the monthly PMI is helping buyers obtain a lower monthly payment, and is helping alleviate the fears of having to take a loan with monthly mortgage insurance. If you know someone who is postponing a purchase to save more money, let them know about this program. This program also allows ALL of the down payment and closing costs to be gifted, so buyers can reach out for a gift instead of having to wait and save up the full 5% down payment. Fannie Mae recently increased the debt to income ratio requirements to 50%, so more buyers are able to qualify for this program now. Buyers only have to put down 5% to purchase a home up to $685k in San Diego, and $715k in LA and Orange County with No monthly PMI. Each county in California has it’s own conventional jumbo loan limit, click HERE to check your county loan limit, or contact me for more details. Let’s take a $715k home purchase and compare the savings using the 5% down Conventional Jumbo loan with No monthly PMI, versus a Conventional Jumbo loan with monthly PMI, and a 5% down FHA Jumbo loan with monthly mortgage insurance. To calculate the total monthly PITI (principal and interest, taxes and insurance), we will use 1.2% of the purchase price to calculate property taxes, which is $715 a month, and $75 a month for homeowner’s insurance. Option #1. The figures on the first column is a conventional 5% down loan with No PMI. The rate is 4.75% on a conventional jumbo 30 year fixed with No PMI. The total monthly PITI payment is $4,333. Option #2. The 2nd option is a conventional 5% down loan with monthly PMI. The rate is 4.5% on a conventional 30 year fixed, the monthly PMI is $300. The total monthly PITI payment is $4,531. Option #3. The 3rd option is a FHA 5% down loan with monthly mortgage insurance. The rate is 4.25% on a 30 year fixed rate, the monthly FHA mortgage insurance is $561. There is also a FHA funding fee of 1.75% due on all FHA loans, this fee of $11,886 is financed into the loan amount. The total FHA monthly PITI payment is $4,751. Option #1 with No PMI will help you obtain the lowest monthly payment. It will save you $198 a month over the conventional loan with PMI, and saves $418 a month over the FHA loan. As you can see below, over the next 10 years the conventional loan with no PMI will save $9,367 over the conventional loan with PMI, and $56,841 over the FHA loan. In Summary. The conventional jumbo loan with No PMI will get you the lowest monthly payment on your home purchase, and save you the most money long term too. Here is a list of frequently asked questions and answers that homebuyers and real estate agents have on the conventional jumbo 5% down loan option with No monthly PMI. We require a 620 credit score to qualify for conventional financing. A 700 is required to remove the monthly PMI. Please note, the lower the credit scores the higher the interest rate will be. No, the 5% down is for Primary Residences only. You have to put down 10% for a 2nd home and 15% down for an investment property. The No monthly PMI option is also available on both. 14. What if I put down 10% or 15%, will I get a lower rate with a larger down payment? This conventional 5% down jumbo program with No monthly PMI also works the same for refinances, as homeowners with limited equity can now refinance up to 95% of their home value with No PMI. For example, many homeowners who bought a home over the past 12-24 months with a FHA jumbo loan and only put down the minimum down payment of 3.5%, have probably gained at least 8% – 10% equity due to appreciation in their local market. Now is a great time to eliminate the monthly mortgage insurance while home values are rising and rates are good. This loan program will help you refinance out of your current FHA jumbo loan with mortgage insurance, and into this conventional jumbo loan option with No PMI, so you can save some extra money and get a lower monthly payment. By removing the FHA mortgage insurance, we have been saving homeowners on average $200 – $300 a month. 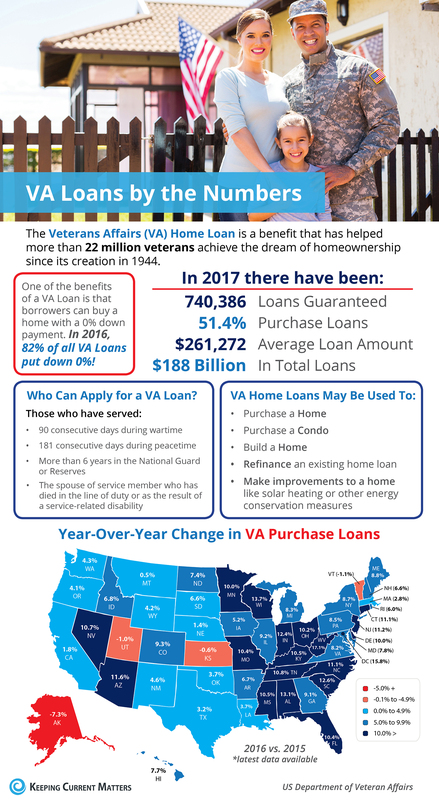 VA financing is one of the best mortgage products available in the market today for home buyers, as the VA makes it easy for their members to purchase a home with zero down financing. This list of VA frequently asked questions and VA tips will help you understand the in-and-outs of how the VA mortgage program works. I also included 6 tips below too that you can use to help get a VA purchase offer accepted. in 2017, 82% of all VA loans put down 0%. Here is a snapshot of who can apply for a VA loan and what type of VA financing is available. Who is Eligible for VA financing? A veteran is eligible for VA financing if he/she served on active duty in the Army, Navy, Air Force, Marine Corps, or Coast Guard and was honorably discharged after 24 continuous months of active duty, or the full period for which called, or ordered to active duty, but not less than 90 days (during wartime) or 181 continuous days (during peacetime). How Much Home Can I purchase With a Zero Down VA Mortgage? VA buyers qualify for zero down financing up to their county loan limit. For example, a VA buyer can get zero down financing in San Diego up to $612,950, $636,150 in LA county and Orange County, and $424,100 for Riverside county. You can check your county loan limit HERE . There is only a small down payment due if a buyer needs to purchase over the county limit. On a $700k purchase in San Diego for example, the down payment due is only $21,762. What is the Minimum Credit Score to Qualify For VA Financing? Most VA lenders require a 620 credit score to offer zero down VA financing. We have a couple of lenders who only require a 580 score to qualify for zero down financing. Do VA Buyers Pay Any Monthly Mortgage Insurance? VA buyers do not need to pay any monthly mortgage insurance (MI) on their loans even up to 100% of the property value, as VA loans are backed by the government. Can VA Buyers Purchase a 2-4 Unit Property? The VA allows their military buyers to purchase a 2-4 unit home with zero down VA financing. VA financing is for owner occupied financing, so the VA borrower would live in one unit and rent out the other 1-3 units. You can also use the rental income from the other 1-3 units to qualify for a loan. This is a great way for VA homebuyers to start out as a real estate investor. How are VA interest Rates Compared to Other Loan Programs? VA mortgage rates are the lowest in the industry and are typically .375% lower than conventional rates. What is the VA Mortgage Waiting Period after a Foreclosure, Short sale or Bankruptcy? Short Sale: It is only 2 years before a buyer can repurchase again using VA financing. Foreclosure: It is only 2 years before a buyer can repurchase again using VA financing. Bankruptcy: For a chapter 7 Bankruptcy it is 2 years and 1 year for a chapter 13, before a buyer can repurchase again using VA financing. There is a misconception out there that the seller must pay for some or all of a VA buyer’s closing costs. The seller is NOT required to pay ANY costs for the buyer, but is allowed to pay up to 4% for VA loans. But there are certain “VA non-allowable” costs for which a VA buyer is forbidden to pay, (for example No escrow fees, wiring, notary, tax service or processing fees etc are allowed to be charged). Here is a good tip to help get a VA offer accepted, so this issue of who covers these VA non allowable fees does not become an issue. Write the following verbiage in the purchase contract, so the seller is not put off by the VA offer: “Seller not responsible for any buyer closing costs, regardless of the selected loan program. All agency-related “non-allowable” costs to be borne/paid by lender”. This means the VA Non-Allowable fees will be paid by a lender credit instead of the seller, we do this for all our VA buyers. So now the seller will NOT dismiss the VA offer right away, does NOT have to cover any closing costs, negotiations are easier, and the buyer and seller can strike a deal. A good idea in this competitive housing market is for the buyers to write a personal cover letter to the seller. Include this letter with your offer that introduces the family and why they are the right candidate to purchase the home. Include a family picture too. If you can tug at the heart strings of the seller, they may be more inclined to choose your offer over others. There are plenty of sellers who will be happy to sell their home to a military family to thank them for their service. Many agents and buyers tell me this strategy works! Include a VA DU underwriting approval with your offer. A DU (desktop) underwriting approval is when a buyer’s loan application and credit report has been ran through the VA’s automated underwriting systems and was approved. A DU underwriting approval displays the most important information on a buyer’s profile, which gives the seller a better idea of the strength of the buyer. For example, a DU approval displays a buyer’s credit scores, debt to income ratios, assets, reserves, any applicable down payment and the type of loan program they are approved for. The zero down payment requirement with VA means less skin in the game. We can’t argue with this because VA allows 100% financing, so this does amount to very “little skin in the game” from a buyer. Therefore it’s a good idea to include proof of reserves and assets and any applicable down payment funds along with your offer, so this shows the seller the buyer has applicable funds to close if any additional funds are needed to close the transaction. Want to show a seller how serious your offer is? Consider putting down a bigger deposit in earnest money. This may seem risky for some, but earnest money is there for a reason. If you are uncertain about putting a “noticeable” amount of earnest money on the table, it may be a sign to the seller that you are uncertain about the house itself. Also, a purchase offer asking for seller credits to pay for your closing costs will usually place behind an offer that does NOT ask for any seller credits. SOLUTION: To make a buyers offer more competitive, the lender can pay for some or ALL the buyers closing costs with a lender credit. How does this work? Instead of taking say a 4% 30 year fixed rate, take a higher rate of 4.25% instead, and now there is a lender credit of roughly 2% available that can be used to pay towards a buyers closing costs. Another Tip. In today’s competitive purchase market, another tip is to offer to pay for the sellers Owners title policy and transfer tax. These fees only amount to roughly $2,500 on a $400k home. For example, if a seller is reviewing 3 offers, and there is a 21 day offer, a 30 day and 45 day offer, often the seller will go with the faster closing. My company Citywide Financial Corp can close a Conventional, FHA or VA Purchase Transaction in 17 – 21 days. We have an outstanding team set up and dedicated to help close transactions fast.